“I…I…I wanted to tell you something, sss..something that I want you to know”, his face flushed as he groped to find the appropriate words. “Ever since we have been together until today, I have felt…. Happy! It feels good when you are with me, I am able to let go of myself. I feel like a newborn child, I feel free and I…I want to be with you. I never felt this good before and I don’t know if anyone else would be able to do this to me. Being with you is like being high on ecstasy, my brain stops working, stops reasoning. And when we part, the thrill makes me…” they had stopped walking now, and he could not speak when her gaze met his’. They had reached the Sunset Rock by now and were hardly walking. She had anticipated it coming, and had been looking forward for it. An independent woman, brilliant and charming as she was, it was not new for her being proposed in creative fashions. But this was the first time a guy was not talking cheeky mellow, but was speaking with sincerity. She was a bit shocked with the bluntness in his expression, though. He said it so fast that she felt he was going to faint or have an attack. She nearly let out a gasp as he finished his line, but immediately recomposed her face. She turned around, and stepped forward towards the railings, towards the setting sun. His gaze lingered on the ground, as if he was some convict. His face was plum, and red. But he was trying to get hold of himself and find some words, an apology maybe. “You know, you are pretty bad at proposing a girl!” she said coyly. “I…I…am…”, as he tried to gulp the knot in his voice, she came to him, closer, until her lips were whispering into his ears, “I want to give you near death experiences everyday, and want die with you at the same time”, and she playfully bit his ear. He was again burning, he dropped to his knees, but this time he was a little better, at least not stumbling or crashing. 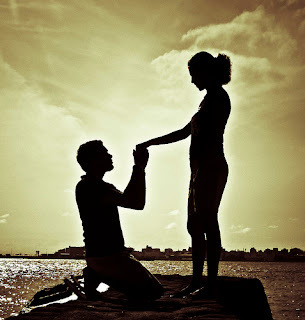 “Are you proposing me?” she asked as if in surprise. “I had rehearsed this so many times, but things don’t take their normal course when you are around. I am too weak to run today, run away from you.” he said with innocence, and a little helplessness. “Please Get up, I can’t take this, you will make me cry!” she pleaded. Before he could move or say anything else, she curled her fingers into his, dropped to her knees and hugged him tightly. Her eyes were flowing unbounded. He couldn’t move, and all was silent again. The hearts were beating in communion now, as if already one. when love is from the heart, then even the most ruthless man can be a puppet in his woman's arms. love is of same intensity from both sides, so why should the emotions be hidden. love should know the depth with which it is loved. You'd be surprised how nervous men can get and how good we hide it. The descriptions, conversations, emotions everything was near to perfect. And then they found out buying a home will take them another 10 years with the real estate prices having shot up sky high...lol. I wont stop until its perfect, just keep telling me. Yeah yeah I know. Just butting a stupid perspective. aww, this was so sweet! i loved all the dialogs the guy says.. amazing piece! Loved it totally! The picture is amazing too! this is adorable :) reminds me of something from years ago! but truly magical! hmm..you really know how to charm someon...the shyness and the nervousness too felt more attractive...and ya many shy guys would want the other side be more supportive in the proposal..
nicely written and most suited for such a wonderful proposal..!! Awwwww!! I love the guy's character. :) Adorable and cute. The last line is amazing. Not many go thinking about it. Wow!! Beautifully written...felt like this was happening for real. just 2 words 2 describe d goodness n loveliness of d post "AWESOME & BEAUTIFUL"
You weaved it beautifully, aww... deep inside, was fantacizing my man to make it like that.. it kept me absorbed..!! Aww, cute one. The guy's so nervous! Emotions are so near to perfect. I am glad you liked it. Make your man know your wish, who knows he makes it much better. Thank You, I will not stop until they are perfect. Oh, I love this, I am so melting. an excellent descriptive piece of emotions...such a smooth narrative flair..romance so well captured!!! Wow! Dangerously close to perfection..! The post is beautiful.Damn,I'd love to be proposed in the cute puppy dog sort of way.